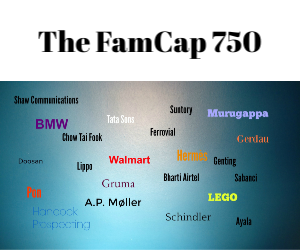 Here’s a good example of family capital helping a family business. The magazine Rolling Stone has just brought in an outside investor for the first time in its nearly 50-year history, according to The New York Times – and it’s family money backing a family business. The investor is BandLab Technologies, a Singapore-based music company co-founded and led by Meng Ru Kuok, the son of the Asian business tycoon Kuok Khoon Hong. The Times article said BandLab will take a 49% stake in Rolling Stone. The famous magazine was founded by Jann Wenner in 1967 and is still owned by the Wenner family; Wenner’s son Gus is currently head of digital for Wenner Media, the company that owns Rolling Stone. He told The New York Times: “This was kind of as strategic as I could possibly find because we have a shared vision and they’re going to be extraordinarily additive as we continue to evolve and transform our business.” A classic family to family investment, which are coming more common these days. Jose Cuervo, the world’s largest tequila maker and one of Latin America’s biggest family businesses, wants to do an initial public offering on the Mexican stock exchange as it seeks funds for expansion. Owned by the Beckmann family, Jose Cuervo is looking to raise between $500 million and $1 billion, say media reports. The IPO has been widely anticipated – here’s some background to it. There’s been no disclosure on how much of the business the family plan to sell on the open market, but the Beckmanns are expected to continue to control Jose Cuervo, which they have owned for more than 200 years. According to a Bloomberg report, fifth generation Juan Beckmann Vidal owns 70% of the family business through a company called Becle. His son Domingo Beckmann, who is CEO of Jose Cuervo, owns the rest. So they could sell a sizable chunk and still retain control. A nice story (in Spanish – use Google Translate if you don’t read Spanish) of how a family-controlled construction materials group in Spain has prospered despite the huge recession in the country’s building sector since 2009. Called Danosa, and based in Fontanar in central Spain, the building company has been able to prosper by developing a big presence in many countries outside of its home base and by introducing new products. Founded in 1964 by Manuel del Rio Dominguez, Danosa is now run by Manuel’s son, Manuel del Rio de la Cal. Anyway, here’s a link to the story for those interested.